(Nepal Foreign Affairs, Feb 26)About 60 representatives, including high-level government officials from Bhutan, India and Nepal — the three member countries of the Kangchenjunga Landscape Conservation and Development Initiative, the International Centre for Integrated Mountain Development (ICIMOD), and strategic development partners Gesellschaft für Internationale Zusammenarbeit (GIZ) and the Austrian Development Agency (ADA), met for the conclusion of the one-and-a-half year preparatory phase of the Kangchenjunga Landscape Conservation and Development Initiative (KLCDI). 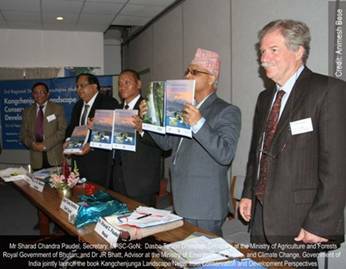 The meeting, jointly organized by the Government of Nepal’s Ministry of Forests and Soil Conservation (MOFSC) and ICIMOD, was held from 23 to 24 February at the ICIMOD Headquarters. During the meeting, partners consolidated the activities of the initiative’s preparatory phase and apprised country delegates of the outputs and content of a draft framework for regional cooperation, which takes into account the need for greater collaboration across borders, as well as opportunities for socioeconomic development at the landscape level. “Having taken these key steps, we can now move into the implementation of coordinated activities for the conservation and sustainable development of this important landscape”, said Nakul Chettri, KLCDI Programme Coordinator. ”It is very important for us to generate on-the-ground impacts to support adaptation and resilience among the communities living in the Kangchenjunga landscape”, said David Molden, Director General of ICIMOD. He also encouraged the initiative partners to use the knowledge and data resources ICIMOD has made available, in particular for geospatial and cryosphere analysis. The three member countries proposed an area of about 25,000 km2, covering parts of eastern Nepal, Sikkim and the northern part of West Bengal in India, and western Bhutan, to be included in the Kangchenjunga landscape, one of the seven transboundary landscapes identified by ICIMOD with its regional partner countries for prioritizing conservation and development programmes in the Hindu Kush Himalayan region. The landscape is one of the richest areas on earth in terms of plant and animal species. There are 19 protected areas in the landscape covering 30% of the total area. More than 4,500 species of flowering plants have been recorded from the region, and there are more than 400 varieties of orchids and 40 varieties of rhododendrons. This region is also home to charismatic wildlife species such as the snow leopard, musk deer, red panda, Asian elephant, one-horned rhinoceros, and Bengal tiger. Many of these wildlife species are endangered and, if proper conservation mechanisms are not put into place, vulnerable to extinction. ”Nepal is privileged to be part of this transboundary landscape initiative, which will provide a platform for the collaborative efforts needed to address regional issues such as human-wildlife conflicts and the illegal trade of threatened species”, said Sharad Chandra Paudel, Secretary at the MOFSC. Dr JR Bhatt, Advisor at the Ministry of Environment, Forests, and Climate Change, Government of India highlighted binding factors for people living within the Kangchenjunga landscape: the commonality of their cultures and their respect for nature. ”We need to shift to a more participatory approach and involve communities so that they have more ownership and responsibility for managing their biodiversity resources”, he said. He also emphasized the strength of the landscape approach being applied in this initiative, and the opportunities it would provide in creating important transboundary corridors to connect not only large and charismatic wildlife species, but also many small mammals and plant species. Reaffirming the commitment of the Royal Government of Bhutan to the Kangchenjunga Landscape Conservation and Development Initiative, Dasho Tenzin Dhendup, Secretary at the Ministry of Agriculture and Forests said, ”Biodiversity, wildlife, and nature do not recognize political boundaries; therefore, all the countries in the Kangchenjunga landscape need to work together to ensure that we can hand over a well-conserved landscape to our future generations”. Mr Dhendup also highlighted the need to use new and scientific knowledge in conservation and development efforts, but not without forgetting the traditional knowledge of the people in the landscape. ”The regional framework for cooperation prepared during this meeting will be the basis for implementing the subsequent phases of the Kangchenjunga Landscape Conservation and Development Initiative. Through this collaboration, we will be able to produce positive outcomes”, said Basanta Shrestha, Director of Strategic Cooperation, ICIMOD. “We need to be innovative in order to adapt to a changing environment”, said Dr Eklabya Sharma, Director of Programme Operations at ICIMOD, adding, “Cooperation in transboundary landscapes like Kangchenjunga provides us with an opportunity to work together to find new solutions to emerging challenges”. During the workshop, the book Kangchenjunga Landscape Nepal from Conservation and Development Perspectives – published by the Ministry of Forests and Soil Conservation in collaboration with the Research Centre for Applied Science and Technology and ICIMOD – was jointly launched by Mr Sharad Chandra Paudel, Dasho Tenzin Dhendup, and Dr JR Bhatt.